…and copious amounts of bubbly! 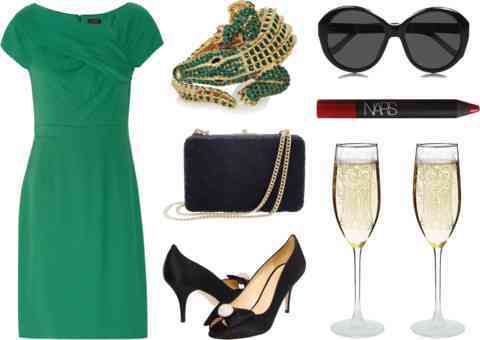 This weekend finds me in Los Angeles for a good friend’s wedding and so I have thrown together a somewhat midcentury modern, Betty Draper-inspired, emerald-infused party outfit featuring a rather dazzling alligator cuff — yes, I realize it completely breaks the bank, but it was so good I had to include it! The neckline on this dress is fantastic, and demands a bare canvas — no necklaces or chandelier earrings, please. Top it off with an updo, a precise cat eye and a crimson lip and you’re ready for cocktails with Don. Other activities will include a bit of auntie duty, catching up with some west coast friends and relearning how to parallel park with my super sweet rental car. If you have any recommendations for me, please do pass them along! Since moving to New York five years ago, my Angeleno intel on what to do and where to go has probably grown a bit rusty. Sidenote: You may have noticed I was a bit quieter than usual this weekend — not because I lacked anything to say, definitely — but more likely because of my awesomely full weekend hiking and camping, I felt a bit less inclined to sit in front of my computer for the next few days. Add to that the preparations for trip I am currently on, the strategy sessions with Lani for Fashion Week, and the general realization that summer is coming to a close, it felt like a good time to take a step back from my usual routine and I am happy to say that I am really enjoying myself. Regular posting will resume when I return to the city. I’ve got tons to dish about and Fashion Week is going to be a blast! I love the whole outfit! So classy! I LOVE that dress!!! You need to post pictures of yourself all dressed for the wedding! I’m having a crafty weekend, also doing some yard work (woo! ), and going to church. Kind of quiet this weekend before heading to the beach next weekend!!! You are currently reading QC Prêt-à-Porter || Guest of the Bride at Quite Continental.